The end of “Amateur” Radio? New mod for my uBitx. 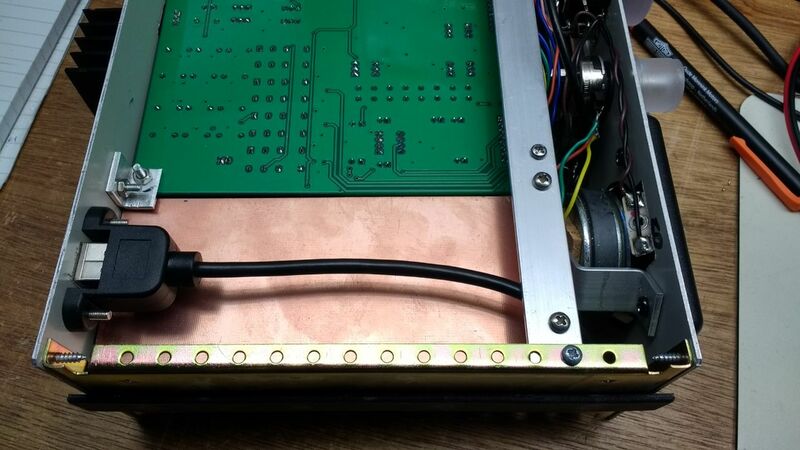 I build a HI-PER-MITE 200hz width active audio CW filter which is designed by David Cripe, NM0S (check out the interview with him on QSO Today). The schematic and working is published on the HI-PER-MITE page of the Four State QRP Group. A few weeks a go I found a stock of suction cups towel holders in my workshop (proberbly bought them years ago) and looking at them the idea came to build a 2m quad antenna that could stick to a window with these suction cups. Continue reading. Because I broke my utc clock the "GPS clock with multidrop databus" project was activated again. From the spareparts I had on stock the first steps are made. With just six mods my uBitx is far from ready. So on to the next page full of mods. 7th mod : Connect the world. Doing software for a daytime job means that I often change or refactor code and for my custom firmware it isn't any different. So it would be nice to be able to update the firmware on the raduino without having to open the case everytime. For a other project I use a panel mount USB cable and I thought it would be a great adition to my uBitx. For this mod I used a panel mount USB Mini B male to USB B cable (google : "Panel Mount USB Mini B Male to USB B "). Now I can update the firmware without having to remove the enclosure covers and even use the CAT option. My FT897 and FT817 have a RX/TX led indicating in green that the rig is in RX mode, and indicating in red that the rig is in TX mode. 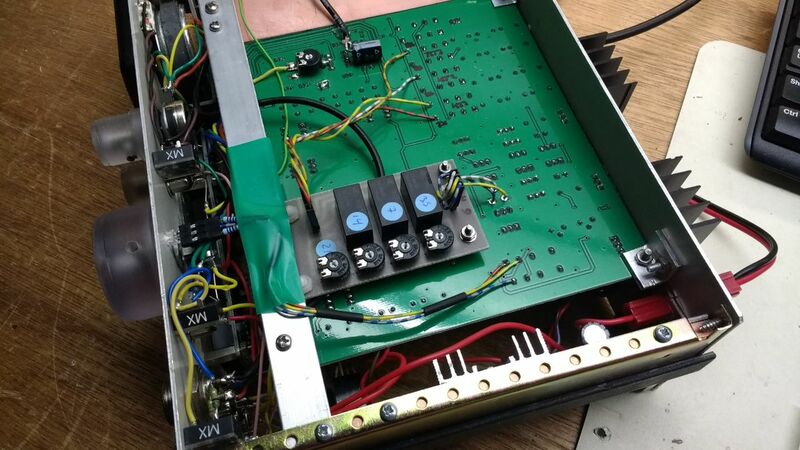 It's the fact that the front panel from my uBitx is getting a little full with all the buttons, knobs, chassis parts and the rather large speaker (starting to think i would have been better to install it in the top enclosure cover). But it's a thing I have to live with although I could decide to create a new cover from scratch (which maybe never happen). Ok, back on topic. 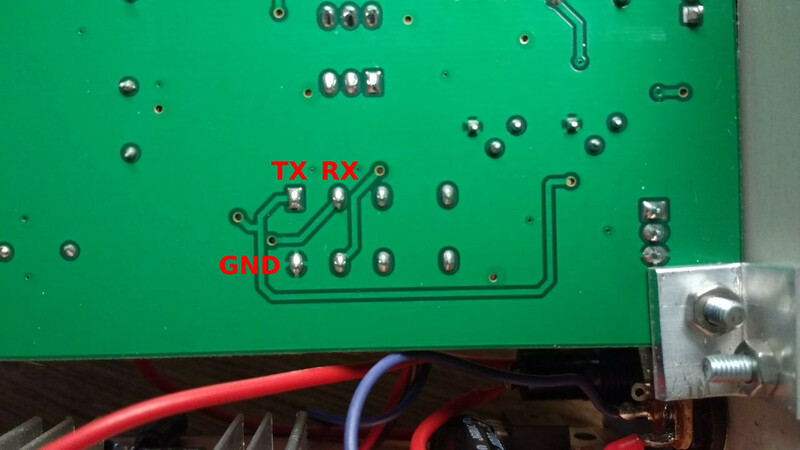 In the uBitx there is a RX and a TX 12V switch line created with the RX/TX relay controlled by the T/R signal from the raduino. Those lines could be used to light up a BI color Red/Green led with a common cathode. The connection on the bottom of the PCB are shown below (the relay is located near the finals). When these spots are located, you just have to solder 3 wires to them and add a 470 ohm resistor to the RX and TX wire. For the connection I used a 3 pins Dupont connector which fits perfect on the bicolor led. Because I have made the maindial from polycarbonate, I drilled a hole just below the rotary encoder and put the bicolor led in it. The clear texture of the polycarbonate lets the light go through showing the RX/TX state. Then its time for the smoke test. Rig powers up in RX and is showing . . . . yellow. Ok, so never trust a bicolor led out of the junk box when you just tested the red part. But ok, it's not red, so RX (confirmed by no TX in the display). 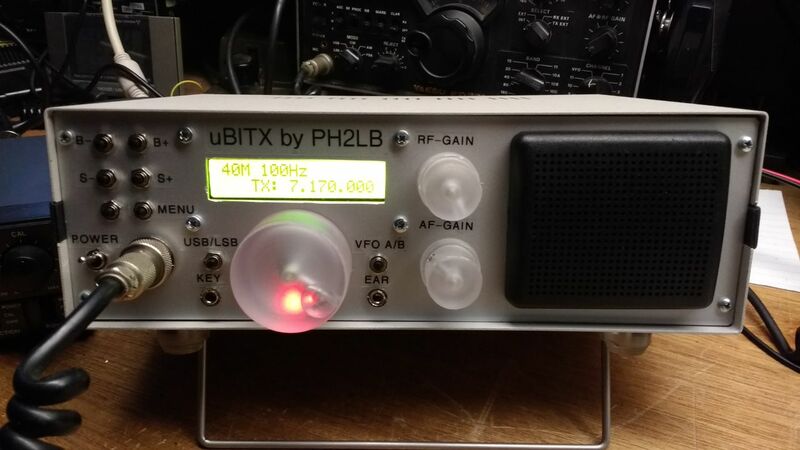 Squeezing the mike and the uBitx switches to TX and showing the red light below the mai dail. Mod confirmed. 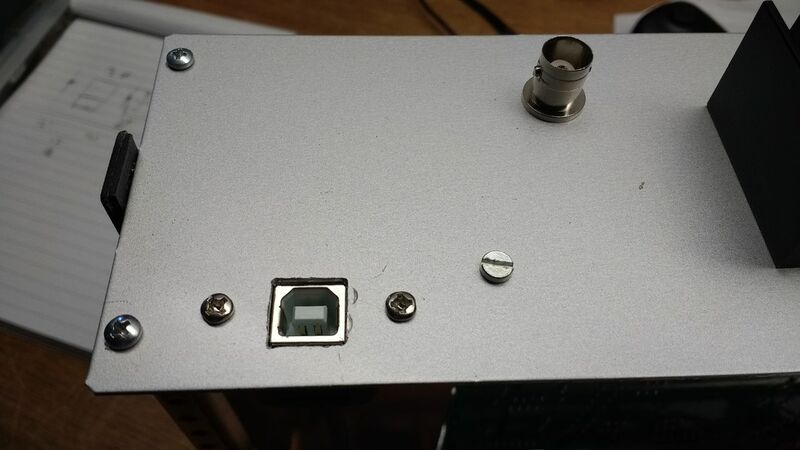 Like allready said in the first mod, Donald ND6T has a nice RFGain (basically a RF Attenuator) for the uBitX : http://www.nd6t.com/uBITX/RF%20Gain.htm which also can be used as a good startpoint for adding a AGC http://www.nd6t.com/uBITX/AGC.htm. I tried to build the AGC as small as possible, but due to functional issues (pain in my hands) I couldn't make it as small as Donald has made it. But overall I'm happy with the result. In adtion to Donalds design I added a small header to it so I can select 3 different release times (resistor 330K, 680K and 1M). By default I have put the jumper on the 1M positions. It's a tight fit due to the USB cable but it fits. After installation I hooked up my scope to the junction C4, R5 & R6 and when I tuned the band, I could see that the AGC in reacting fast to the noise pieks. What I did find out is that the RF Gain / AGC combination has some dB attenuation on the speaker output. But that was to be expected. I have connected the spare A7 on the raduino to that junction for future implementing of a S meter in the custom firmware. But first I have to make a stable and output adjustable noise generator to measure the reference signals. Check out this wikipedia page for the levels. 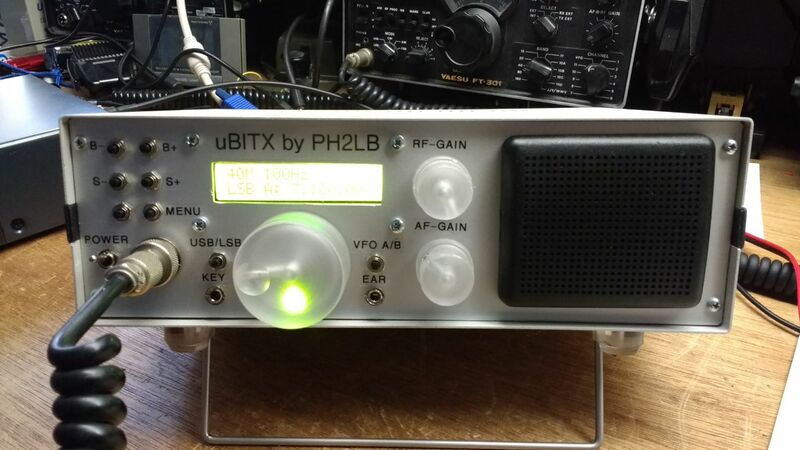 The uBitx is known for the uneven TX output depending on the band selected. On uBitx.net there is a article adressing this problem and pointing out variouse fixes. 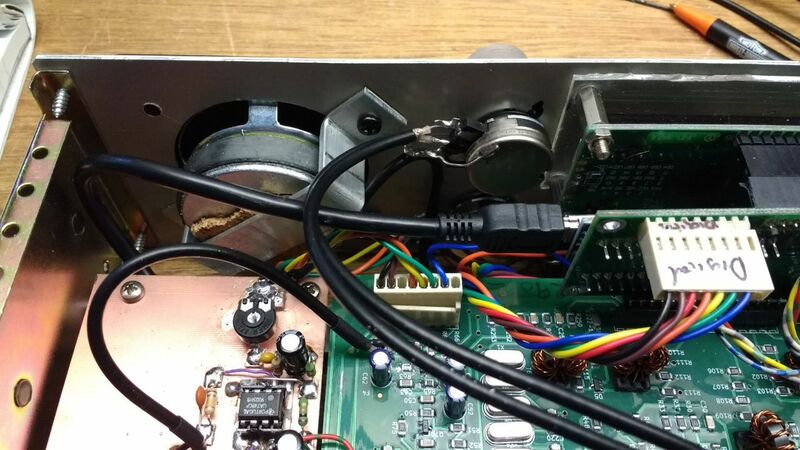 Allison KB1GMX states that the pre-driver and drivers stages are the main source of the problem and she suggest to replace the existing 2N3904 transistors with better onces like the 2N2222 (metal can TO18), change the bias resistors to match the new transistor and change C81 to flatten the output powercurve. Parallel up R941, R911, R96, and R942 to get 11 ohms each by placing a 22 ohm resistor across each existing resistor. These resistors can easily be stacked if you use 1206 surface mount parts. 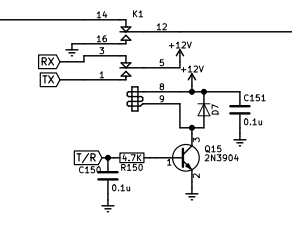 Replace Q90 with a BFR106 transistor. I have tried this mod and replacing Q90, R81 and C81 is a good start. The power output increased on the high bands a little and the poweroutput on the lowbands is more flat (sorry forgot to write down the impact of this part of the mod). Then I changed the Q911, Q912, Q92, Q93, Q96, Q97 to 2N2222 and R941, R911, R96, and R942 to 11 ohm. A test showed that the power output indeed was higher on all the bands, but also that the driverstage transistors where getting real hot (to hot to touch). There fore I removed the 11 ohm resistors and re-installed the 22 ohm resistors again. In this configuration the uBitx is giving me a 5W up to the 17m band and going down to 2W on the 10m. But the driverstage transistors aren't getting hot anymore (ok, they become hand warm with a long qso). So this mod isn't done yet. I'm happy with a more even power output over the bands, but it would be nice to get atleast a litte more (10W would be nice). 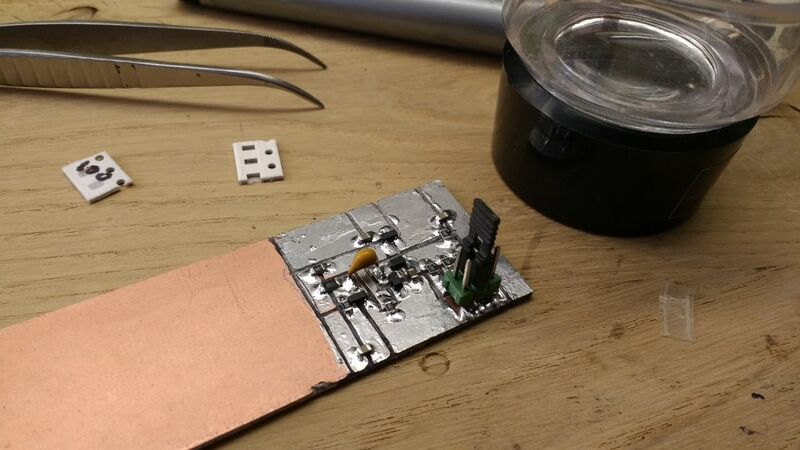 I have plans to to try the relay and potentiometer solution from Bill K9HZ. One thing I didn't like about the #uBitx is the variation of the power output on the different bands. I know it's a know issue but starting with 10+ and dropping to low as 0.1W is way much. I have tried variouse mods and the latest (and IMHO the best) is the Relay and potentiometer solution from Bill K9HZ. Depending on the selected band, the band groupings are 80/60, 40/30, 20/17, 15/12/10, a specific potentiometer is selected. 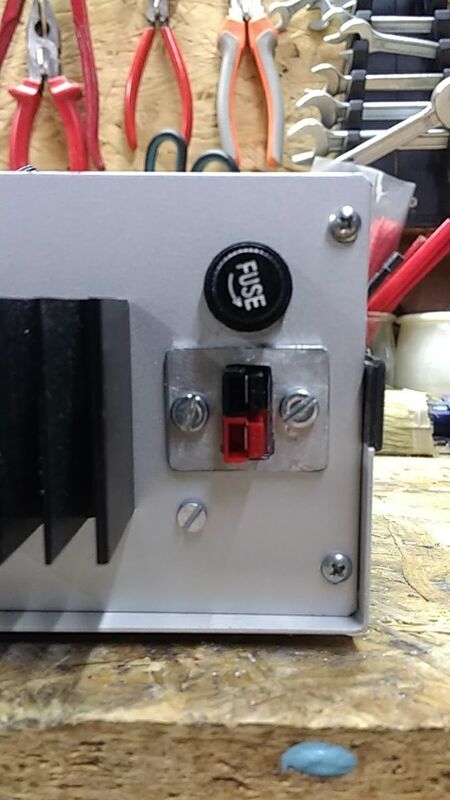 I have implemented the mod and now the output power is (by use of the morse key) : 80m=10W, 60m=6W, 40m=10W, 30m=6W, 20m=8W, 17m=4W, 15m=4W, 12m=4W and 10m=4W. Looking at the band edge drop-off of the groups, I want to measure where the drop-off starts (preamp or in the bandpass filters). But that a thing for another time. At this moment I have almost maximum power on the band I like to work with the most (80, 60, 40, 20m). 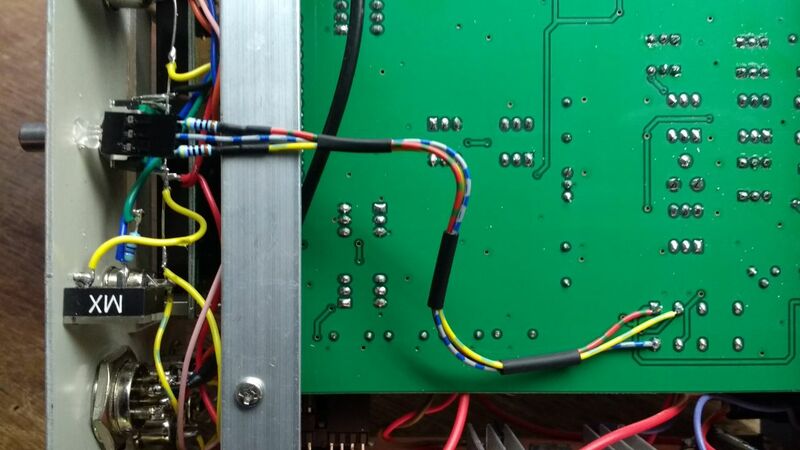 The V3 uBitx board with the AGC installed, loses some dB on audio volume which can be anoying. On the Dutch Hamradio forum www.zendamateur.com Egbert PAØEJH advised that you will get a little extra gain by just changing the collector resistor of Q70. He stated that when you would add a resistor of 4K7 parallel to the collector resistor of 4K7 the gain would increase 3x. When you add a 2K2 resistor the gain would increase 4x. It's a easy procedure to try out and I used the 2K2 resistor. The audio output increase noticeable and I haven't found any problems with distortion. .
For a lot of power application I use the Anderson PowerPole connectors because of there flexibility in configuration. And for that reason these connectors have been widely adopted in the hamradio scene (just google for "anderson powerpole hamradio" ). 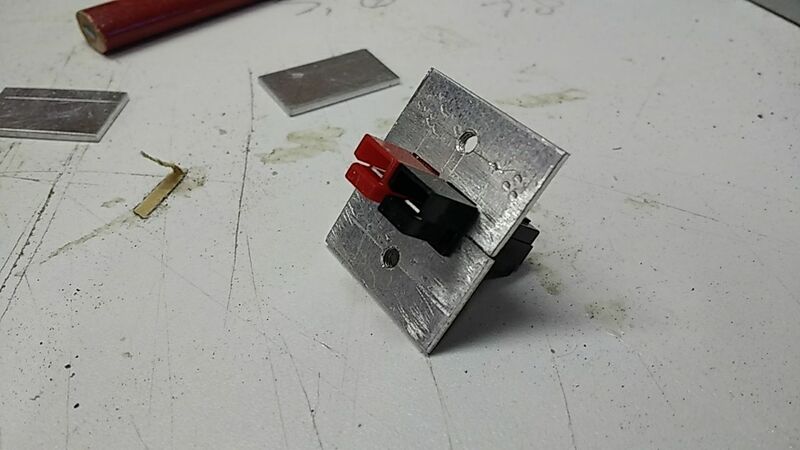 For a chassis installation of these connectors you have to use 2 plates which hold the connectors in place. Normaly I have these in stock but today the weren't so it's DIY time. 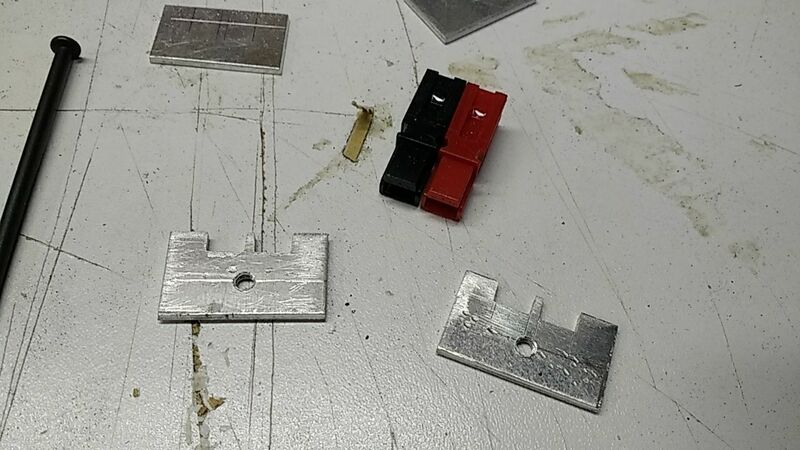 I made 2 sets of the plates out of 1.5mm thick aluminium and cut out the 2 slots of 6.4mm (7.9mm - 2.5mm) which happend to be the excact size of the file I used. (for the correct sizes, check out the drawing on this link ). I drilled the 3.3mm holes in them and cut a M4 treat in the holes. Putting them together it starts to look good. 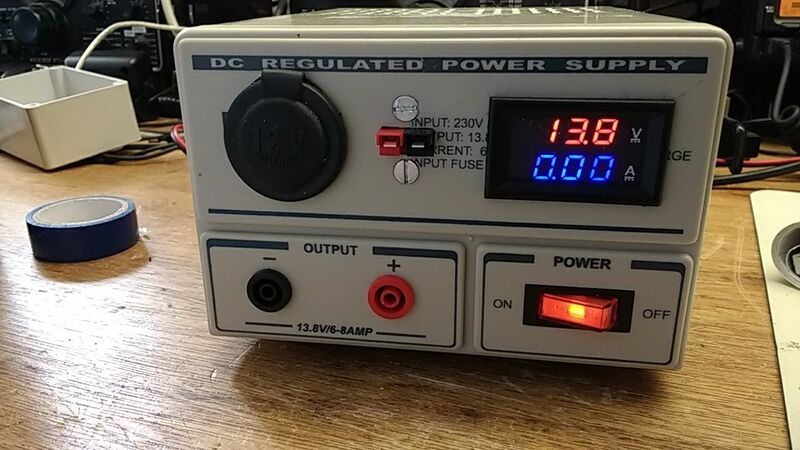 First I installed a set in a DC Regulated powersupply which I have modified over the years with aditional power socket and voltage / current indicator. 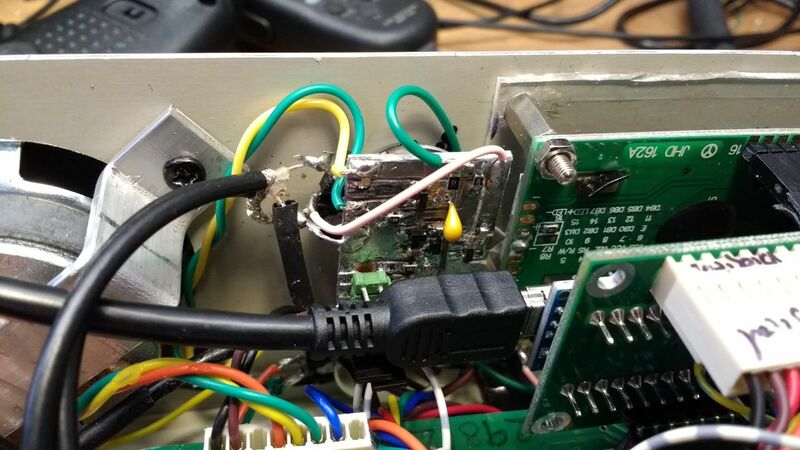 For the uBitx I have added a external shield to cover up the large hole from the original DC connector. © Alle rechten voorbehouden. Overname van materiaal van deze site is uitsluitend toegestaan na het verkrijgen van schriftelijke toestemming van Lex Bolkesteijn.